President Obama has begun his campaign to have Irish Americans support him in November with a special St.Patrick's Day offer. 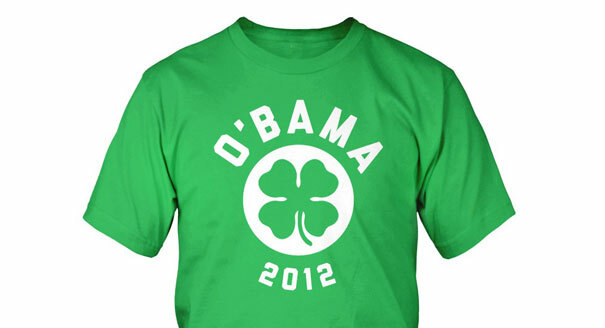 Politico.com reports that the Obama campaign is offering supporters a chance to buy a special 'O'Bama' T-shirt — just in time for St. Patrick's Day. Obama is capitalizing on the success of his visit to Ireland last year. Last week in New York current Irish leader Enda Kenny stated that Obama had said his time in Ireland has been "one of the best days" of his presidency. Obama went to Moneygall in Offaly where he received an ecstatic reception in the village where his ancestor, Falmouth Kearney, had left during the Famine era. "St. Patrick's Day is around the corner. This year, show your support for a presidential candidate with Irish roots: Barack Obama," the campaign wrote in an email to supporters. "You might recall that back in 2007, as he was on the campaign trail, the President found out about ancestry. Last year, he traveled with the First Lady to pay a visit to Moneygall, the town of 300 people where his great-great-great-grandfather was born, and jokingly told a crowd there: 'My name is Barack Obama, of the Moneygall Obamas, and I've come home to find the apostrophe we lost somewhere along the way.'" The shirt features a four leaf clover, not a shamrock, which is sure to draw some comment but Obama officials are clearly hoping his irish trip will serve as a reminder to Irish Americans of his heritage.